It’s back to school time and time to make learning even more fun. This is a great project for a classroom or for home. As you create each state, learn the capital and something unique about the state. Adhere 12" x 12" patterned paper on top of the 12" x 12" piece of cork with Ultra Thin Glue Dots. Cut one of the outline Maps of the USA to show just the USA and Hawaii/Alaska (cut away any white/negative space that is "water"). Adhere the map cut out to the 12" x 12" patterned paper with Ultra Thin Glue Dots. Cut up the individual states from the second map of the USA. Use these as templates to cut out the states from the patterned paper. Adhere the patterned paper states over the outline map that is attached to the 12" x 12" piece of patterned paper. Use Ultra Thin Glue Dots on the larger states and Mini Glue Dots on the smaller states. Place finished map in frame. 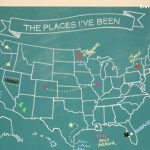 Use push pins on map to mark locations where you've visited. This craft is reprinted courtesy of Glue Dots.